Greeting to anyone that is reading. It has been a long week. Due to a major incident at work I got very little time in the shop this week. I did however manage to demo an entire room at work so maybe that will count as some extra time. I did get enough time to complete what I was working on on Sunday when I got the call from work. 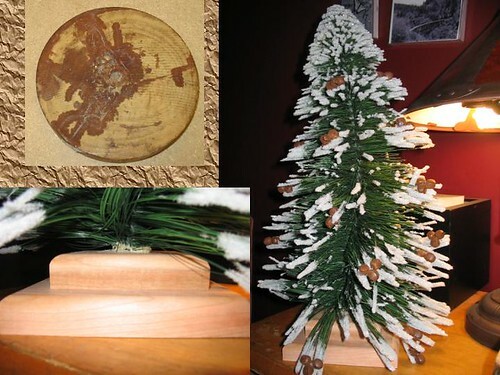 A coworker had this little Chrstmas type tree that she liked to display, unfortunatly she had bumped into it and knocked it over knocking it off of the base. The original base is shown here, I truy can not believe it actually held this thing up. It is only 3” round with barely a 1/4” hole in the center for the tree stem, the tree however is 12” at its base and almost 2’ tall. As you can see I made a very simple base but added some bulk to it. The new base is made from unfinished cherry and is 6” at the bottom and 4” on top with a nice deep hole that the stem was stuck into then filled with glue. I believe this should help it stand much better. Nothin really special about the work but I did in the process discover that my router table was in dire need of a cleaning and hence I disassembled it and cleaned it well in order to finish this project. On a slightly similiar but different note, my family and I happen to be in the vicinity of a large swedish furniture store the other day. Now I don’t mind wondering around there and looking for some ideas and small items. Yes I used buy their furniture to. But not any more, however I did come up with this deal. These are all pine, not overly fond of the color but figured I can fix that since they only wanted 59 cents for each piece. 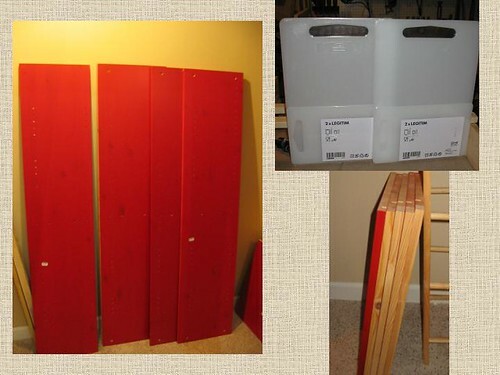 Decided on the spot that they would offer an inexpensive solution to a linen closet problem we currently have. So look for that one inthe next few weeks, hopefully. The other deal I found tere was for the cutting boards in order to cut them up for jigs the 2 pack was only $3. The ideas and the paper tape measures are always free. So if you ever fnd ourself in the vicinity f one it might be worth wondering around. most of their furniture s pretty easy to figure out and would work great out of real wood. Well this week I am pretty busy with some training and other items at work but I will plan to post something next week . Until then, have fun all.